Performing a background check on potential employees before hiring them is a standard part of the hiring process for many companies in various industries. You need to be aware of any potential issues regarding an employee’s criminal history, work history, and other aspects of their background that could affect their ability to do their job. However, once a person is hired, how much attention does your company pay to your employees’ lives outside of work? There is one thing that many employers are missing when it comes to background checks: Rescreening your current employees at a later date is just as important as screening new hires if you want to avoid potential problems. It’s standard for many companies to conduct background checks during the hiring process, but a significant number of them neglect to do it once they have made their hiring decision. This worrying issue leaves a substantial gap in human capital risk management. While a large majority of companies conduct background checks, a survey by HireRight in 2013 revealed that only 47% are re-screening employees after hiring. This leaves employers unaware of anything that might have happened with the employees after they have been hired. What’s the harm of not conducting regular background checks on current employees? You might be wondering how neglecting to re-screen employees could have an adverse effect on your company. For example: a criminal background check becomes outdated the day after it is conducted as the criminal database will be updated with new offence daily. That means in some cases, you will find different results on 2 police check certificates from the same person that were conducted in a short time apart. Regulatory changes will also affect what will be released on the certificate. Perhaps you may think that if someone passes a background check during the hiring process, they’re unlikely to do anything unsavoury once they are hired. However, these things can be kept secret from employers and the real issue is that organisations too often assume their initial snapshot of an employee is enough. For example, what if an employee has their driver’s licence suspended due to driving under the influence of alcohol or being involved in an accident. If driving is part of their position, they would need to inform their employer. But if driving is not part of their position in the company, the employer might not be aware of any potential traffic-related offences that have occurred. It could even be a symptom of a larger drinking problem which causes further problems in the employee’s personal and work lives. Another example can be a company might continue to give financial duties to an employee who has had significant money troubles at home. Leaving these types of issues to go unchecked could cause huge problems for your company. It’s important for a company to first identify the gaps they may have in their human capital risk management. If your company hasn’t already conducted background checks for new employees, this should be the first step. However, even if you do conduct initial background checks, your policies may have changed over the years. Perhaps new employees today are reviewed much more stringently than those you hired several years ago. A new screening could be required when it has been a long time since the last one, or during significant moments in an employee’s career with the company. For example, when someone is promoted or switches departments, you might decide that rescreening is appropriate. You may inform your staff that a recheck might be required before a promotion, for example, or when an employee is handed new duties to perform. It will also help to make your employees aware of the screening process and ensure they get plenty of warning before a check is carried out. Another advice is to help reassure every one of the consequences if a potential issue is flagged up during a background check. Perhaps let them know that it won’t necessarily lead to anyone losing their job, but could help you to resolve any problems so that they can stay on as a valuable employee. You can, of course, give them the opportunity to tell you about an issue before it is discovered by the screening process. Make sure you have a police checking policy in place. If your police checking policy does not cover a re-screening policy, you need to provide an updated version and make sure all employees in the company agree to it. Create a list of employees that require an updated background check. Consider the most date when you have received the result of their last background check as well as the type of background check that was conducted (criminal background check, Right to Work Check, Driving History check, etc), the inherent risks of the position to the company,… when you make the list. Consider creating a positive culture around police checks. 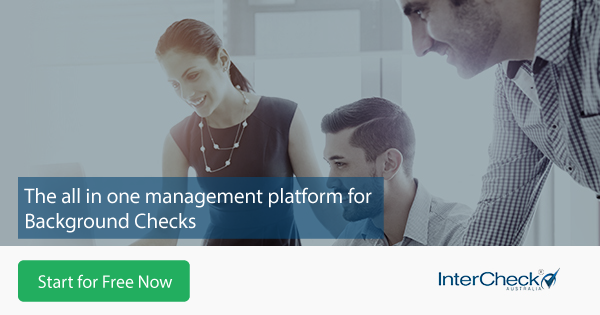 If you do not have an online system to manage all of the checks, consider a background check provider that has the capability to provide you with streamlined solutions. It will save you lots of time and ensures that your compliance is always on point. If you have an online system, talk to your IT department or your providers about your needs. Make sure they provide you with an ongoing alert system and automates re-screening options when it is due to expire. 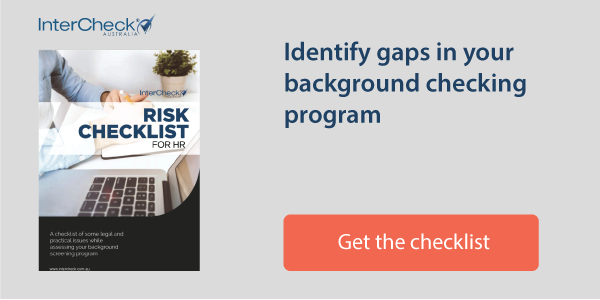 By performing background checks on current employees, organisations can take a significant step in closing an unfortunate and wholly unnecessary hole in their overall screening programs.